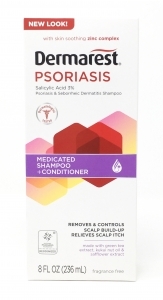 Dermarest Psoriasis Medicated Shampoo Plus Conditioner with 3% salicylic acid and zinc complex is specially formulated to relieve the symptoms associated with scalp psoriasis. This fragrance-free shampoo plus conditioner removes and controls scalp build-up, soothes irritation, eliminates itching and restores moisture. For best results use at least twice a week or as directed by a doctor. Wet hair thoroughly, massage liberal amount of product into scalp, leave lather on for several minutes, rinse thoroughly and repeat if needed. Active Ingredients: Salicylic acid (3%). Purpose: Psoriasis and Seborrheic Dermatitis Treatment Inactive Ingredients: Purified Water, Ammonium Lauryl Sulfate, Sodium Laureth Sulfate, Sodium Citrate, Cocamidopropyl Betaine, Lauryl Glucoside, PEG-150 Pentaerythrityl Tetrastearate, Coco-Glucoside, Glyceryl Oleate, Aleurites Moluccana Seed Oil, Zinc PCA, Panthenol, Rheum Palmatum Extract, Carthamus Tinctorius (Safflower) Flower Extract, Camellia Sinensis Leaf Extract, Edetate Disodium.